While we think extra pay is the most important thing we can do, there are many other things that we’ve done. Most importantly is helping them improve the quality, consistency and design of the items they make. They can now sell into any market in the world and while EarthDivas is a great sales channel for them and probably the largest, it won’t always be this way. Another key things we do is help them source fittings such as buckles, rings, zippers and snaps as well as fabric and yarn. I’ll go on to Alibaba.com and find vendors and put them in touch with these folks. I’ll then pay in advance for the fittings and the fabric so they can buy in bulk. We store this material and use it over time. I also share my thoughts on how we can improve the product, such as giving the handbags more structure, and making the handles firm, and adding more stitching around the handles. When I visit Nepal I bring defective items so they can see the stress points. Understanding how the product breaks down goes a long ways towards improving it. One thing I am most proud of is the inspection process we created. 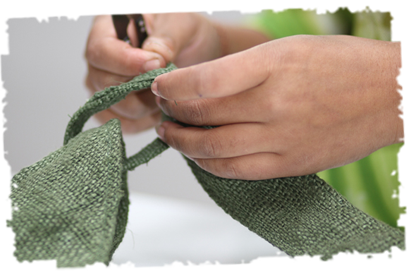 In this system, we start by sorting out the quality of the hemp fabric into good, ok and bad. The good fabric is used for all expensive, natural, hemp products. The ok is used for dyed items and less expensive items such as coin purses, and for large items like backpacks and messenger bags. The bad hemp fabric is not used. Then we created a series of dyed colors that are numbered, such as Brown 1, Brown 2, Brown 3, etc…. these are all different shades of brown. For each color, we have different color variations. Now for each item we have color codes which greatly improves the quality and consistency. Another focus area for us is training. 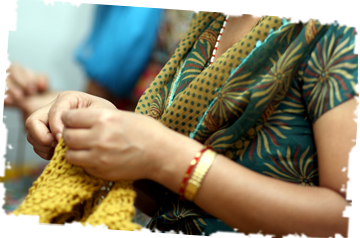 In India, we work with a fantastic group called Creative Handicrafts (creativehandicrafts.org). They have a very thorough and systematic process to train artisans. The higher the skill level, the greater the pay. In Nepal we are working with a few artisan groups that are helping women learn how to work with sewing machines. Items made with sewing machines pay more. 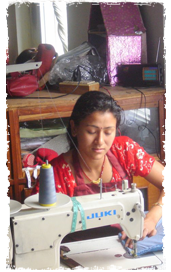 Typically, in Nepal, only men work with sewing machines, and men are not willing to train women. But we have a several women owned artisan groups that have set up training rooms and when production needs are low, they have agreed to do training for a very small fee. This helps us increase our production capacity so if we ever get a really large order we can produce it, and it helps them because the more complicated items such as handbags and computer bags simply pay more.